Even panda wants to be in Superbowl series !! 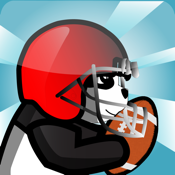 This cute panda found american football in the jungle. He tried to be a good player like american football players! Now it's your job to train him throw like quarterback and run like running back.